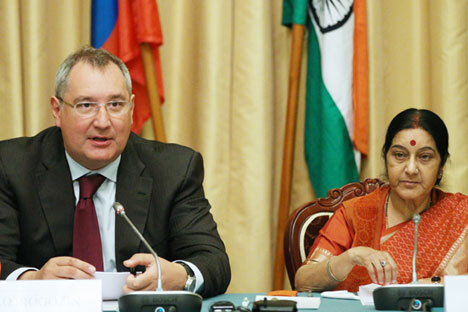 Russia's Deputy Prime Minister Dmitry Rogozin (L) and India's Foreign Minister Sushma Swaraj attend a meeting of the Russian-Indian Inter-Governmental Commission at Moscow's Volynskoe Congress Park Hotel. Russia is ready to actively participate in the implementation of large-scale projects to develop Indian economy, Dmitry Rogozin says. External Affairs Minister Sushma Swaraj and her Russian counterpart, Deputy Prime Minister Dmitry Rogozin signed a protocol on Tuesday, at the end of their talks within the framework of India-Russia Inter-Governmental Commission on Trade, Economic, Scientific, Technological and Cultural Cooperation (IRIGC-TEC). Swaraj led a high-powered Indian delegation to the 21st meeting of IRIGC-TEC to prepare a strategy to implement the joint “Druzhba-Dosti” vision of President Vladimir Putin and Prime Minister Narendra Modi, through concrete initiatives in different fields of bilateral trade and economic cooperation over the next decade. Swaraj and Rogozin cochaired the meeting, which included high-level officials from both sides. The IRIGC-TEC is a key institutional mechanism to promote and strengthen India’s “special and privileged strategic partnership” with Russia. During the meeting, the sides focused on the main issue of working out a plan to bolster strategic partnership between the two countries. Swaraj also held bilateral talks with Russian Foreign Minister Sergei Lavrov to fine-tune the agenda of Putin-Modi summit in December, in Moscow. While both the leaders have met a couple of times, at the sidelines of multilateral summits this year, they will review and supervise the progress in realizing the “Druzhba-Dosti” vision, at their bilateral annual summit, a source told RIR. Speaking about the importance of the recent protocol, the External Affairs Ministry’s spokesman Vikas Swarup said that the protocol carried forward the spirit of Druzhba-Dosti vision. “Carrying forward the Druzhba-Dosti, Swaraj and Rogozin signed the protocol for the 21st session of IRIGC-TEC,” Swarup noted. The current situation in the sphere of bilateral trade and investment was high on the agenda of the IRIGC-TEC. The sides discussed the issues related to trade and investment, and decided different measures to boost economic ties between the two countries. A number of joint working groups and sub-groups had already submitted their reports, highlighting the problems to be discussed and resolved. In view of the fact that the sides had already expressed their desire to shift to rupee-ruble trade and are conducting talks to reach an earliest agreement, the issue of trade and investment, including transition to bilateral trade in national currencies, was high on the agenda of the Moscow meeting. Addressing the commission, Rogozin said, “The the issue is about achieving the bilateral annual trade turnover of $30 billion and $15 billion of mutual investment by 2025.” The trade turnover in 2014 was $10 billion. In particular, he mentioned oil and gas, nuclear energy and renewable energy as the priority areas of bilateral cooperation. “The cooperation program in oil and gas sector has already been launched,” Rogozin noted. Rogozin also assured that Russia was ready to support India and actively participate in the implementation of large-scale projects to develop Indian economy, in near future. However, in his remark, Russian First Deputy Minister of Economic Development, Alexei Likhachev stressed on the main difficulty the sides are facing in the transition to the bilateral trade and investment in their national currencies. Likhachev said although the two counties want to shift to trade in their national currencies, their banking systems are not yet ready for being actively involved in the process. “This is a burning issue. Our banking systems are not ready to actively respond to the request. We would like to expand trade in national currencies,” he said. An anonymous source said that the sides exchanged opinions on this issue and decided to speed up the transition process to rupee-ruble trade. “It may take some time before the sides work out a concrete mechanism to transition to mutual trade in national currencies of India and Russia,” he added. According to sources, as a first move towards rupee-ruble trade, India and Russia may organize exchange trading of the two national currencies in each other’s country. On her part, Swaraj said that Russia had always cooperated with India in developing its economy. "Russia occupies a special part in the heart of every Indian. The strength of our unique strategic partnership with Russia withstood the test of time. I am confident that this special bond that India and Russia share will strengthen every year as we deepen our cooperation and expand it and develop it to new avenues and options,” she said. “India and Russia are natural partners in the legacy of excellent cooperation in key sectors such as nuclear energy, defence and space. However Russia can be an even bigger partner in India's development process as a source of technology, machinery, equipment and knowhow," Swaraj noted. Referring to the proposed free trade agreement (FTA) between India and Russia-led Customs Union, she said that India attached great importance to developing the cooperation with the Eurasian Economic Community (EAEC), which will help the expansion of trade and investments with Russia. Swaraj said that Modi’s “Make in India” proram has created an immensely positive atmosphere to facilitate investment in India. She said that Modi and Putin have identified strong economic relations as a key priority area in the Indo-Russian strategic partnership. In his opening remark at the bilateral talks with his Indian counterpart, Lavrov said that Swaraj’s visit to Moscow would give an additional impetus to the development of agreements between Putin and Modi. "The privileged partnership between our countries is a unique achievement of our peoples,” he noted. He also referred to the coming visit of Indian Defence Minister Manohar Parrikar to cochair the meeting ofIndia-Russia Inter-Governmental Commission on Military, Technical Cooperation (IRIGC-MTC), in early November. In a way, Swaraj’s visit also prepared the ground for India-Russia defence cooperation talks to further strengthen strategic ties. On her part, Swaraj said that Russia was a tried and tested friend of India. "If we talk about the bilateral relations, Russia is our proven true friend. This notion of our friendship we see not only at the governmental level, but at the level of our people also,” she said. In order to give an additional impetus to raise the level of trade, economic and investment ties, Rogozin invited Swaraj to visit Russia in July, to participate in the international industrial exhibition “Innoprom 2016” in Yekaterinburg. The invitation was accepted by Swaraj.